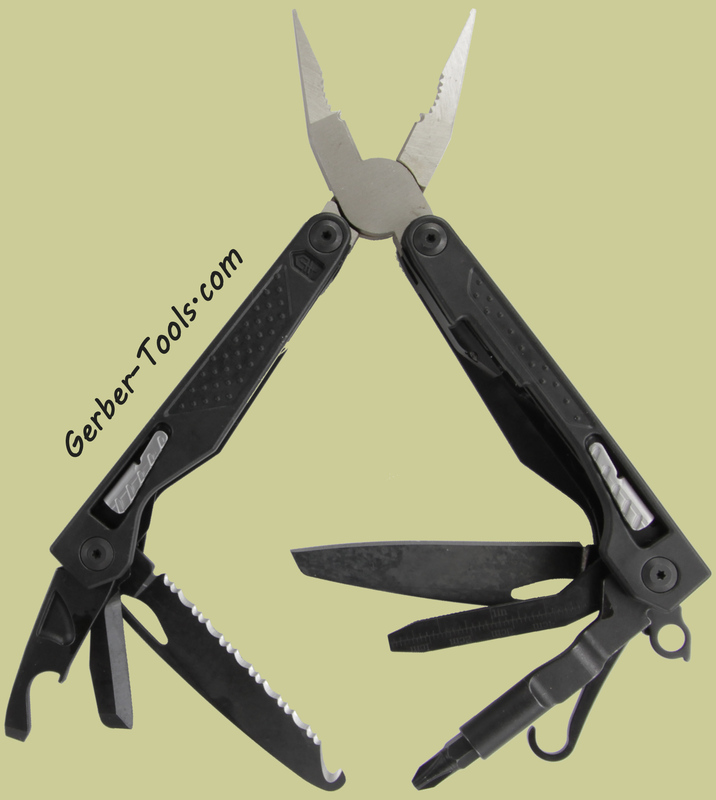 Gerber MP1-MRO Maintenance, Repair, & Operations Tool 30-001031. This heavy duty tool is designed for maintenance, repairs, and operations. 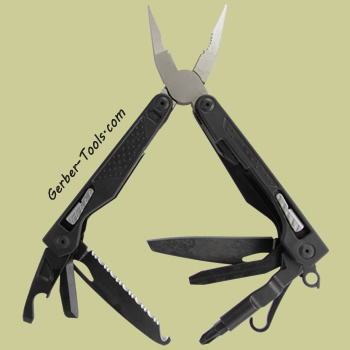 It is equipped with task-specific tools and a 12-piece universal bit set. There are 15 different tool inside, including: Spring loaded needle nose pliers, regular nose pliers, wire cutter, wire stripper, tool lock, web cutter, serrated blade, fine edge blade, large flat head, medium flat head, bottle opener, utility/scraper blade, bit driver, tire depth gauge, cotter pin puller, file, and a lanyard It has a closed length of 4.3 inches and features full-sized serrated and fine edge blades for tough cutting and slicing. 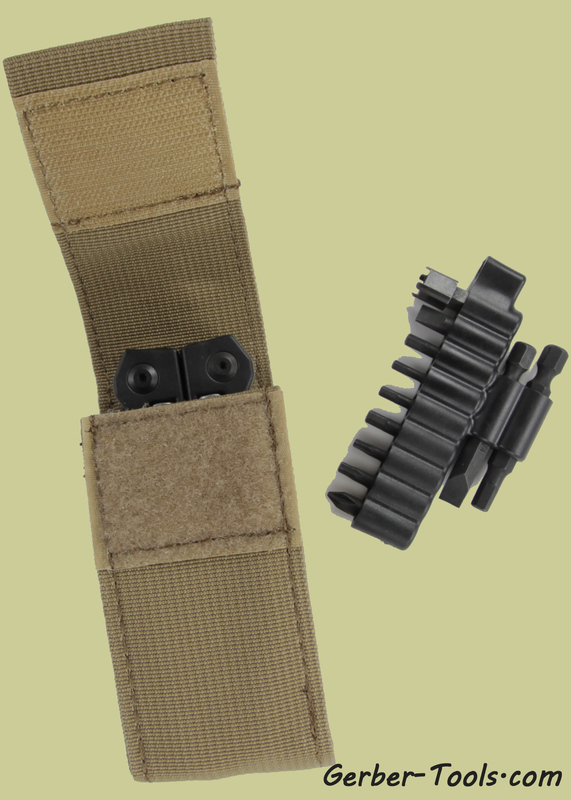 It also comes with a MOLLE compatible Tan 499 nylon sheath, that fits the multi-tool and the bits too with the front pocket. Belt loop on back can fit a 2 inch belt and does have a snap so that it can be opened and close to fit around something, like a back pack strap or boot strap and then secured back with the snap. 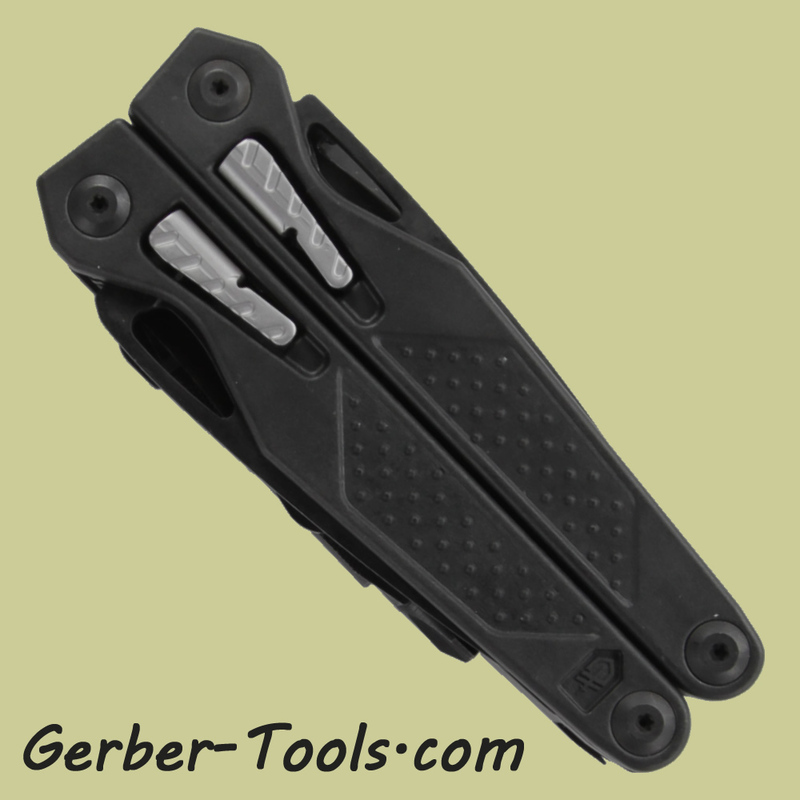 This is the Gerber MP1 model 30-001031. This is an MRO maintenance repair and operations tool. I have it closed up here to show you just how neat it is, how nice compact it is. 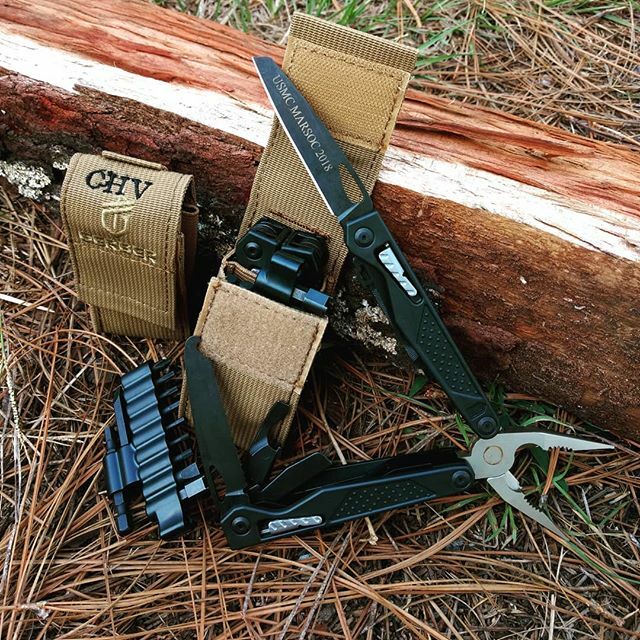 This is at Tan 499 nylon sheath. Not only can it fit through your belt loop but you can also unsnap it that way. You can go anywhere - bootstrap, arm strap, anywhere. But not only do you have room for your tool, it also comes with this 12 piece universal bit set and it is tight. You know it took me a little bit to get in there but it definitely fits in this front pocket and therefore you've gotall of your choices here for your bit sets just right there at your fingertips. So I just think that is really neat. So since it is expandable it can just kind of go with it. Now here is the MP1. They have kind of changed them and this is a multi-tool , but it is not your classic one. So instead of metal or stainless steel for the handles you have got this nice grip system. And uncovered here to help you with holding your grip here. A it is closed this is 4.3 inches so the handle is still made with glass filled nylon, but with grippy inserts. So here you are gonna have a butterfly opening. Here we go I was doing the thing for the tools so sorry. Okay butterfly you see that so it is not as much as you push on it. It just kind of helps spring back so again that is going to cut down on your work reducing the load you have to push that through. You have got your sharp needlenose here, your wire cutters there. The blade inside is made with 420HC steel. You have got forged spring-loaded jaws. This is a magnetic bit driver so again, pulling one in and out it is gonna be really stuck in there you saw that. Okay so that magnetic is really holding that in there. When you are ready to use that I like how you can come all the way here you saw that locking mechanism. Push that into place. It is not going anywhere, and then when you are ready to to use this or any of your bit sets here you have got a firm hand placement. And it is not going anywhere so you can get your job done. Okay so lets see we have got a fine edge nail file and see what how are they going to call that a cotter pin hook. That blade oh yeah I did say that already it is fully made of 420HC blade. But that is that number 12 is the cotter pin puller you have got a tire depth gauge, you have got a file and... Let us see what else is on this side. Oh, your lanyard hole there you go that is what that is. Lanyard hole, file and then this is the cotter pin puller. Okay again they just all closed down in and whichever one you have out and locked in place you do have to pull through with the locking mechanism in order to release that. Your other side this is the one that is going to have the serrated blade and you saw that just lock into place. Okay now your wire cutters are right here in the head as I'm pulling these now. Okay it is at all of them. Okay so on the serrated blade you also have this tip here that they want us to point out. This is called a web cutter so very sharp little hook there. Adds a nice extra feature. Then we have the utility scraper blade, you have your large flat head and then right here you have your bottle opener. so kind of like a two and one on this middle feature here. Okay so we just closed those in. Close that blade butterfly it around nice and compact and let us see if we did we say the weight on that yet it does not. Okay I am not finding a way to per se right now but it is nice, light and compact I think you will all be well pleased and have many new many missions many functions that this tool can provide for you. This is the MP1 MRO maintenance repair model 30-001031.